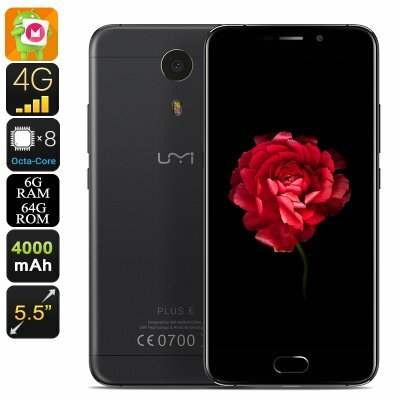 Successfully Added UMi Plus E Smartphone - Android 6.0, Octa-Core CPU, 6GB RAM, 4G, Fingerprint, 5.5 Inch Display, 4000mAh to your Shopping Cart. With the launch of the UMi Plus E, we get once again introduced to a flagship smartphone produced by a Chinese smartphone manufacturer that is guaranteed to rock the mobile industry. Coming with the latest specifications, this Android smartphone is ready to take on the world. Not only does this Android phone pack the latest software and hardware alike – it comes with an unbelievably smooth design, giving you the feeling as if you are holding a true piece of art in the palm of your hand. Holding the Heilio P20 processor, this Chinese phone holds some serious power within - guaranteeing that it can handle whatever you throw at it. Clocked at 2.3GHz, this Octa-Core CPU introduces us to an extremely powerful performance like never seen before in the mobile industry. Whether you like to enjoy playing intensive mobile games or make use of the most demanding of mobile applications – this revolutionary chipset guarantees to handle every extreme situation without dropping a frame. The UMi Plus E additionally comes packed with an incredible 6GB of RAM, letting you enjoy the most extreme multitasking sessions without ever needing to worry about slowing down your device. The phone’s 5.5-Inch Full-HD display truly can be seen as the crown piece of its design. Supporting 1080p it allows you to enjoy all your media in breathtaking quality. The latest display technology brings along a high color saturation, allowing this Chinese smartphone to display all movies, games, and pictures in stunning detail and vivid color. Along with its extremely thin bezel, the UMi Plus E delivers a visual experience like never before. Thanks to the phone’s epic 4000mAh battery you will be able to enjoy all your favorite media along with all the amazing features this smartphone has to offer for 20 hours continuously. Packing so much power, this Chinese Android phone gets you through multiple demanding days packed with excessive smartphone usage without ever needing to worry about running out of juice. Running on an Android 6.0 operating system the UMi Plus E brings along an exceptionally smooth user experience that allows you to enjoy the latest Android features the industry has to offer. Google Play gives you access to millions of free to download movies, games, and applications that can be enjoyed to their absolute most on this powerful smartphone. Packing 64GB of internal storage and offering the possibility to add a truly mind blowing 256GB of external memory ensures that, with this Android phone at hand, there will always be some space left for you to store your favorite files and media. The UMi Plus E comes with a 12 months warranty, brought to you by the leader in Android phones as well as wholesale electronic gadgets..
Fast delivery,the product is exceptional it is a value for money for sure. this phone is an awsome innovation I wish I buy it soon, I like everything about it ! Superb Phone, I love it very much. It is really value for money. Regarding the specs 4 GB Ram, 64 GB ROM, 4000 Mah battery & P20 mediatek processor this is very fast and the look is premium, touch is brilliantly smooth. For this price we can't get a these specs in any other premium phone. Regarding the Camera 13 mp rear and 5 mp front are good, but if the rear cam was 16 mp & front was 8 mp that would be fantastic. I am very satisfied with this phone. Regarding the price of this phone was high in other sites (Gearbest, Ali express etc) when compared to Chinavasion website. If the camera was high, that would have been excellent.